What a day for Lerner and Rowe Gives Back! Everyone was talking about how grand the day was – and, of course, you did not leave one detail out. Everyone enjoyed the play, the food, the auction items, prizes and especially, the helicopter drop !! what a show! On behalf of Worldly Kids, I wish to thank you for this special gift of $5,000 – what a surprise… your team always pitches in and helps all needs, so we are very honored to be included in that list, and especially honored to receive this donation. Thank you again and I look forward to working together, as we grow and I hope you know I am always ready to help you, in any manner, if you ever need some help. What a great day at Troon! Looked like everybody was having fun. You and your staff should be extremely proud of the fact that this tournament will allow Lerner & Rowe Gives Back to help so many great causes. We are so honored to be a recipient of Lerner and Rowe Gives Back. Because of your support, Phoenix Rescue Mission and The Changing Lives Center can offer the homeless, hungry, and addicted a bright and hopeful future. Your generosity provides hundreds of men, women, and children with a second chance at life. On behalf of our Board of Directors, enthusiastic volunteers, PRM’s dedicated staff and most importantly the clients and guests we serve, thank you so much. May God bless you for your heart for The Least, The Last and The Lost. Lerner and Rowe Gives Back was “Mixin’ It Up for Spring” at Cortney’s Place 2016 Fashion Event and Luncheon. The proceeds we donated will benefit the organization and help enrich programs provided through their center in Scottsdale. To learn more about the Cortney’s Place volunteer and donation opportunities call 480-419-5852, go to their website at CortneysPlace.org or contact Donnette Hermes via email. Lerner and Rowe recently gave the United Food Bank out of Mesa, Arizona a donation that equated to 2,000 meals. 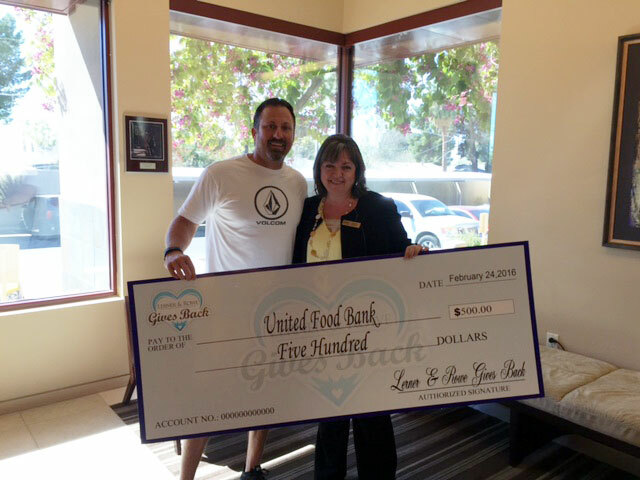 United Food Bank was referred to our gives back foundation through a social media campaign. The campaign made it possible for the grand prize winner to pick the charity of their choice to receive a donation of $500. The winner chose the food bank as a means for them to pay forward the generosity they received from the food bank during a personal time of need. I just wanted to send a quick email to say thank you, again, for the $500.00 check to United Food Bank. We were so excited to receive this donation from Lerner and Rowe Gives Back. $500 means 2,000 meals to those struggling with food insecurity in our community. United Food Bank is an affiliate of Feeding America. They were founded in 1983 as a means to provide educational outreach programs on how to fight hunger and nutritious food distribution outlets. They service the greater East Valley and Eastern Arizona. 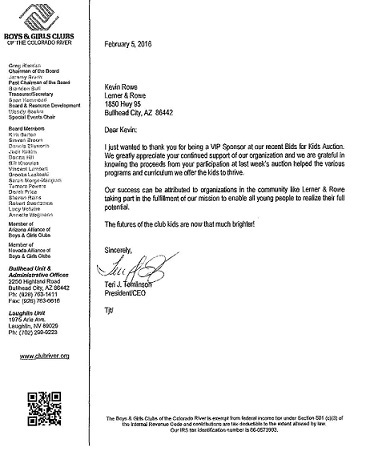 Boys and Girls Clubs of the Colorado River sent a letter of appreciation to Lerner and Rowe for supporting the Club’s annual Bids for Kids Auction. The letter reflects the same belief of the Lerner and Rowe Gives Back Foundation – that the success of local community programs is due in part to organizations coming together, giving back and helping them reach their full potential and thrive. The Club offers a variety of programs and curriculum to enhance the lives of children living in and near Bullhead City, Arizona. Interested in learning more about the Boys and Girls Club of the Colorado River? Call (928) 763-1411 or go online to clubriver.org. Thank you again for sponsoring the Danny White Quarterback Award for the 23rd Annual Champions Luncheon last month at the Hilton Scottsdale Resort. The recipient was Mason Moran of Chandler High School and presented by Jack Lengyel in Danny’s absence. Your continued support is greatly appreciated as we inspire our youth to compete in the classroom as well on the gridiron and assume leadership roles at their high school and future college campuses. Our new Executive Director, Mark Weiss, will be reaching out to you shortly so that we may present you with the traditional Football. I was able to use your ad from the Spring banquet in the luncheon program by doing some creative photoshop techniques. Wishing you well as we move into the 2016 year and hope to see you soon. Be sure to check out the website at aznff.org. Phoenix Rescue Mission sent a thank you letter to personal injury attorney Kevin Rowe and the Lerner and Rowe Gives Back Foundation for the $7,500 donation they presented to the Mission in support of it’s 2015 Code Red Heat Relief campaign. during the blistering summer months. Learn more about the Mission and other volunteer and donation opportunities at phoenixrescuemission.org. 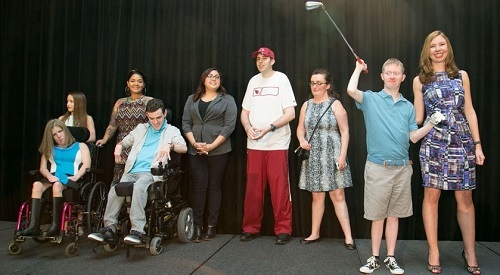 Our 2nd Annual Lerner and Rowe Gives Back Charity Golf Classic was a huge success! We are extremely grateful for the generosity and support shown by the individuals and corporate sponsors who helped make this community fundraiser happen. Our team was especially pleased to share a portion of the proceeds raised that day with Phoenix Rescue Mission to assist them with their annual Code Red summer heat relief campaign. Phoenix Rescue Mission sent the following thank you note in appreciation of the donation that Kevin Rowe and Glen Lerner surprised the Mission with on Friday, May 1st. Dear Cindy, Kevin and the entire staff of Lerner and Rowe that helped in the golf tournament, I am still overwhelmed by the warm and compassionate treatment that Sue and I experienced at the Golf Tournament. Your generosity and faithful support of Phoenix Rescue Mission is appreciated so much. Lerner and Rowe Gives Back continues to be a major partner in PRM’s mission to save lives through Code Red. The $7,500 you donated will provide relief to tens of thousands of men, women, and children suffering on the streets of Phoenix during our blistering heat. We’ll be able to purchase nearly 45 PALLETS of water with your donation. I cannot thank you enough for all the hard work involved in putting on such a smooth running golf tournament. I think Sue and I were able to let so many people know about what we do at Phoenix Rescue Mission and if 1/3 of the people that said they would help provide water to PRM donate, I would be thrilled. May God bless you for your caring heart for The Least, The Last, and The Lost. The Valley of the Sun Chapter of the National Ovarian Cancer Coalition’s sent out a thank you email for sponsoring their 6th Annual Run/Walk to Break the Silence on Ovarian Cancer®. The email stated that there were more that 718 participants of the run/walk and that through combined efforts, the event raised $69,931! The funds raised from the 6th Annual Run/Walk to Break the Silence on Ovarian Cancer® will support Valley of the Sun Chapter of the National Ovarian Cancer Coalition’s mission to help save lives by fighting to prevent and cure ovarian cancer, and improve the quality of life for survivors. The Valley of the Sun Chapter of the National Ovarian Cancer Coalition is already beginning to plan their 2015 Run/Walk to Break the Silence on Ovarian Cancer®. If you would like to join their Run/Walk Planning Committee, you may contact them at [email protected]. You can also learn about future events and volunteer opportunities by following them on Facebook at https://www.facebook.com/NOCCValleyoftheSun. Lerner and Rowe Gives Back received the following thank you note from a young girl named Brooke, who is currently fighting congenital heart disease (CHD). Lerner and Rowe was a sponsor of her’s for the 2103 Arizona Congenital Heart Walk that took place Sunday, November 3, at the Tempe Diablo Stadium in Tempe, Arizona. The annual walk is dedicated to help fight congenital heart failure in both children and adults. The Congenital Heart Walk is also another way to honor and remember the millions of individuals and families that have been impacted by CHD. More information on how to support and get involved with a walk in your area may be found at www.congenitalheartwalk.org.